"I can see your long rest hasn't done anything to cure your megalomania. Have a jelly baby." The Fourth Doctor is a natural bohemian who permanently left UNIT in order to return to a life of deep universal wandering. More so than his previous incarnations, he is thrilled by discovery and adventure. Galvanized by higher purpose, he is disarmingly loopy (constantly offering friends and foes jelly babies), brilliant and entirely serious, all at the same time. 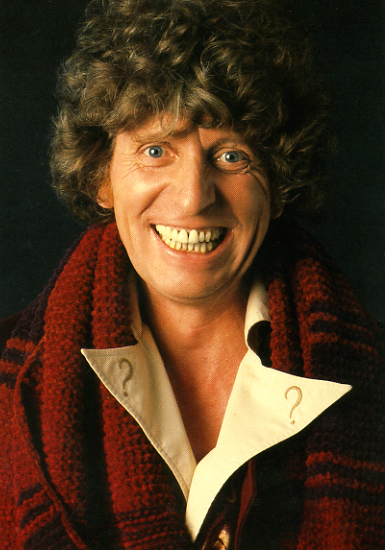 To an extent, the Fourth Doctor is the most unpredictable of his incarnations, befuddling all with his intelligence, constantly leaving others wondering if they have his full attention and using his more off the wall mannerisms against adversaries to distract them while arranging to take control of the situation. His keen judge of character also enables him to navigate his way through situations with new people, helping him to discern friend from foe. Although like all his selves he prefers his brain over his brawn, he is a capable swordsman and fighter, following on from the martial expertise of his immediate former self. He improvises non-lethal weaponry when necessary (Genesis of the Daleks) but was also not averse to more lethal weaponry as a necessity, against both sentient and non-sentient beings- like the matter-destroying DeMat Gun (The Invasion of Time) or contemporary firearms (Image of the Fendahl and The Talons of Weng-Chiang). Despite his charm and offbeat humour, the Fourth Doctor is arguably more aloof and sombre than his previous incarnations. He could become intensely brooding, serious and even callous, and would keenly scrutinize his surroundings even when playing the fool. In stories such as Pyramids of Mars he is concerned that he is approaching middle age and often contemplates his outsider status. He could also be furious with those he saw as stupid, frivolous, misguided or evil. When taking charge, he could be considered authoritative to the point of egocentricity, but as it is, he is usually the only one capable of solving the situations he finds himself in. He generally maintained his distance from the Time Lords, remarking in The Pyramids of Mars that while being from Gallifrey, he doesn't consider himself a Time Lord. He clearly resents that even after they had lifted his exile, they continue re-entering his life when they deemed it necessary. Not only did he seem more inclined toward a solitary existence (The Deadly Assassin), he also emphasized his distance from humanity, although he has stated on more than one occasion that he found mankind to be his favourite species. Two of the Doctor's most significant companionship occur during his fourth incarnation. His friendship with Sarah Jane Smith is implied to be deeper than the relationships he shared with other companions to that point. She is consequently still profoundly affected by their separation many years later in her personal time line. His relationship with Romana (specifically her second incarnation) borders on romantic attraction while being bolstered by her capacity to maintain pace with his mental processes. The largest proof of his influence on her is when she chooses to exile herself from Gallifrey to explore new worlds and help others, as he himself has done. Oh Tom Baker. One of the best Doctors around, and one I really like and think is awesome. Yet I can't say he's my favorite Doctor, or even favorite classic Doctor. Something about Tom Baker's Doctor throws me off. It's not his alienness which is just wonderful and adds to the eccentric streak. Nor is it his emotional detachment. Sometimes I think that things needed to "matter" more to him- scenes of outrage like in The Pirate Planet should've happened more. Either way, he brought in some of my absolute favorite stories and the legendary scarf. Tom Baker I salute you! I still think he is overrated, personally. I do like him, don't get me wrong. TB for the first few years put in excellent performances before he started phoning it in towards the end. But even when at his best he didn't stand out as amazing in comparison to any of the others. He put his own stamp on the show and made his mark, but I think the bulk of his popularity is made up by two major factors. Firstly, he was lucky enough to be in the role when Doctor Who had some absolutely amazing writers working on it, and I think some people may be blurring 'great story' with 'great Doctor'. The other factor is that he was in the show for so long that a huge chunk of fandom associate him as being 'their' Doctor, and so is remembered more fondly for that too. I mean, regardless of who your favourite is, your first Doctor is always special. Add to that the fact that he was in the role when the show made it to America, which expanded his reach but didn't really open up previous Doctors to new fans. I don't want to take anything away from the guy because I do think he was really good, but I do think he has some fan-bias popularity, which makes him seem better than he actually was. That may be true. It's particularly true now with the internet and more widespread obsessive fandom. Most people tell you to start with Tom Baker and he becomes your favorite. Or he's the one you hear about the most in passing, so he becomes your default favorite. Plus what you say about writing. He may be a little overrated, but not without reason. I have to disagree about your 'first Doctor'. Many people I've talked to say that their favorite isn't their first, even if their favorites are usually 10 or 11. My favorite is the 7th, yet he's probably the fifth Doctor I ever saw. On the other hand, people seem to have an uncanny knack for sticking strong to David Tennant- it's strange. He was my first Doctor but I never grew so attached as the fans who say they bawled their eyes out and refused to watch more Who because it was Tennant-less. As she said though, even if your first Doctor isn't your favourite, he is always sort of 'special', which I think is right. The DT thing I think stems from the fact that lots of people started watching during his era, but the difference is that many of them aren't interested in the show before Eccleston, and so from their POV there are just hree Doctors to choose from in terms of favourites. CR only did 13 episodes and then Tennant had a sizeable run, so when MS took over I think a lot of people, especially those not used to change/regeneration, took a lot longer to come around. There will always be the ones who won't accept any other Doctor, but I think the number of Tennant obsessives has declined rapidly the longer MS has been in the role. His popularity has really soared. This is exactly correct, though I personally feel no special connection with the tenth. He's down my list with the fourth, though they're both great Doctors. As for what you say about the new series, it's too true. I've encountered people who didn't even realize there is a classic series. It makes you wonder why they never ask about the titling of "ninth", "tenth", and "eleventh" if that were so. I even met someone online who believed Eccleston was the first. It's sad that more people don't take an interest in the classic series. It's a bit understandable considering how daunting the twenty-six seasons are, but I will always try to change the minds of those who believe that because it is old, it is not worth it. I thought myself someone who had that mind set until I realized that I was very forgiving of cheesy special effects and dated designs (though I did have to Picard facepalm at the Zarbi, I admit). I think for most people it comes down to the fact that the classics are so 'cheap'. By todays standards at least. Most people see the dodgy greenscreen or wonky sets and assume its bad. If you look past that and see it as a product of its time and just enjoy the story, then it's easier to see that there is a lot of fun and adventure to be had with the classics. Before I started posting here, something was discussed or agreed or whatever on the forum to set up a sort of book club style section for the classic series to get people who havent seen it (or those who just want a rewatch) to start watching and discussing it, which is pretty fun and seems to have got people checking out the classics. I think the stories are chosen randomly, but a new one is posted each week then people go away and watch it, then come here to discuss various elements of it. You should join in and check it out if you haven't already. Its the Infinite Quest section. I watched this weeks story (The Dominators. Grrr) last night and so will be posting in there shortly. Your book club thing sounds great. It was attempted at Reddit but with the high speed 40k member community, it never would've worked. Have you seen the Adventures with the Wife in Space blog? Couple Neil and Sue Perryman watch classics from Unearthly Child to Survival. The fun part is that Sue isn't a fan of classic Doctor Who. It's quite funny and entertaining. They're up to Pertwee now. What's interesting is that I never assumed that the special effects were what rendered something bad. I assumed that old tv was bad because it was slow paced, boring, and mainly, couldn't compare with the entertainment of today. But actually, in my case, unless it's on the level of Horns of Nimon, I can never really tell if something is cheap or not. None of the seventh Doctor stories struck me as particularly cheap though I hear that production values were on the downside at the time.